Golden Tulip Qaser Al Baha Hotel - Executive Suite - . 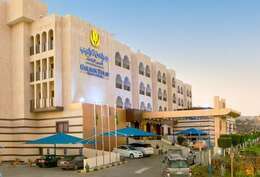 Golden Tulip Qaser Al Baha Hotel - Standard Double Room (2 Adults) - . 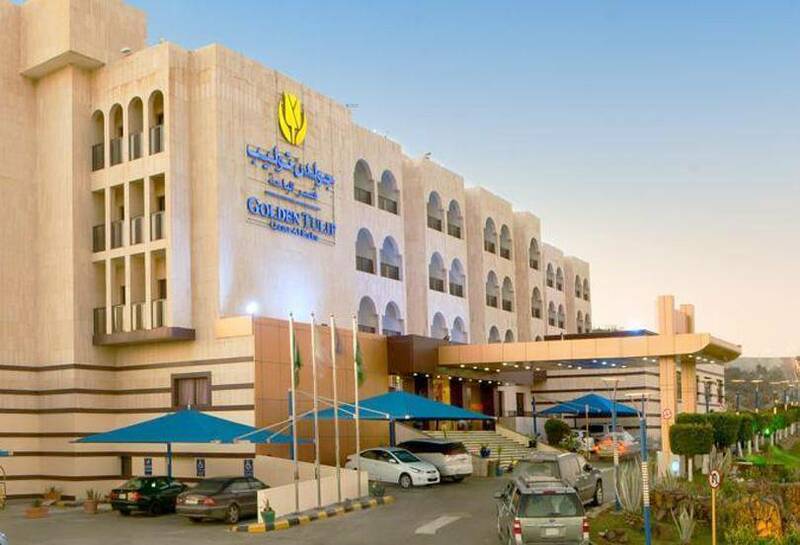 Golden Tulip Qaser Al Baha Hotel is a 4 stars hotel subordinate to Golden Tulip Hotels Chain and situated at Al Shefaa Street, Al Baha City near Al Goniam Mall and 45 kilometers from Al Aqiq Airport. The hotel has a fascinating front and wonderful design with modern furniture and consists of 82 rooms. It features comfortable standard single rooms, standard double rooms, executive suites, and junior suites. Enjoy exploring the significant landmarks of Al Baha City such as fitness first , Alnoras restaurant and Al Baha Province Emirate. The hotel features free WiFi and car parking for your comfort. When would you like to stay at Golden Tulip Qaser Al Baha Hotel? The suite offers two bedrooms with two twin beds or one queen, sitting area , 4 TVs , and two bathrooms for enjoying a convenient accommodation . Golden Tulip Qaser Al Baha Hotel - Executive Suite - Golden Tulip Qaser Al Baha Hotel - Executive Suite - Golden Tulip Qaser Al Baha Hotel - Executive Suite - . The suite features one queen bed, sitting area, and bathroom to relish a wonderful residence . Golden Tulip Qaser Al Baha Hotel - Junior Suite - . The room features one queen bed and bathroom to have enjoyable times and comfortable accommodation. Golden Tulip Qaser Al Baha Hotel - Standard Double Room (2 Adults) - Golden Tulip Qaser Al Baha Hotel - Standard Double Room (2 Adults) - Golden Tulip Qaser Al Baha Hotel - Standard Double Room (2 Adults) - . The room offers one queen bed , balcony , and bathroom for enjoying a wonderful accommodation. Golden Tulip Qaser Al Baha Hotel - Standard Room - . Golden Tulip Qaser Al Baha Hotel contains an incredibly convenient rooms with total of 82, equipped with all sort of services and amenities such as sitting area and bathroom. The rooms have several attractive decors with types and sizes include: standard single rooms, standard double rooms, executive suites, and junior suites. Golden Tulip Qaser Al Baha Hotel contains very elegant restaurant with a magnificent view named Chtoura Restaurant . 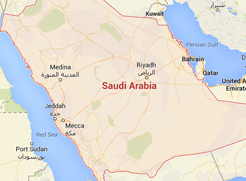 it offers a wide variety of continental and Lebanese dishes . Golden Tulip Qaser Al Baha Hotel also contains a modern coffee shop that offers hot and cold drinks with snacks . Golden Tulip Qaser Al Baha Hotel offers an outdoor swimming pool , hair salon , beauty shops , game room , SAUNA , whirlpool , and child background . Golden Tulip Qaser Al Baha Hotel has very elegant banquet facilities and rooms , the first one named KHALED hall which can accommodate up to 300 persons and is ideal for any type of big event like wedding and ceremonies .also it has LAYALINA HALL which can Accommodate up to 100 persons and is ideal for medium wedding ceremonies, graduation parties and cocktail reception also there is LIALINA ball room which can Accommodate up to 150 persons . Golden Tulip Qaser Al Baha Hotel has different meeting rooms, the first one named Al Andalusia Meeting Room which can accommodate up to 15 persons.And the second named ANDALUSIA which can accommodate up to 20 persons. The third meeting room named BUSINESS CENTER MEETING ROOM which can accommodate up to 20 persons the fourth one is AL Madina meeting room which can accommodate up to 20 persons.